If I had to pick a favorite room in my house it might well be my son's nursery. I didn't choose a traditional 'theme' for the nursery. I don't like things that are that matchy-matchy. Instead I just picked colors and it kind of came together from there. Of all our rooms, this one has by far the most number of handmade and custom items. Some by me, some by family, some by friends...all adorable. 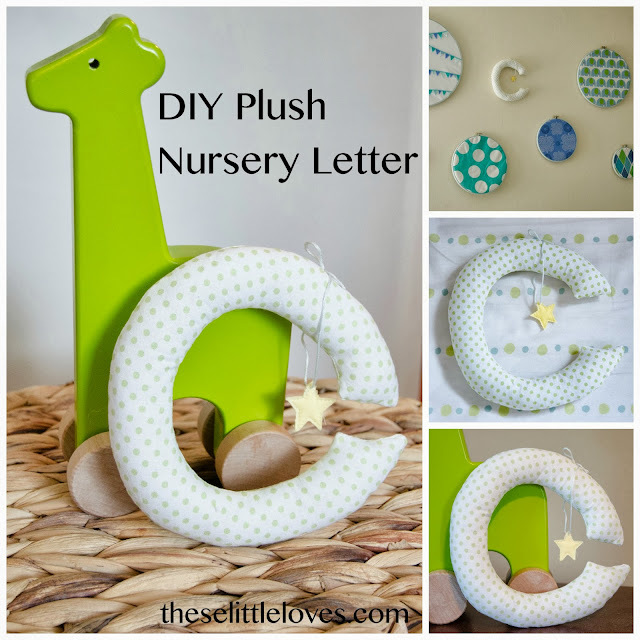 I'm sure I'll talk about other parts of the nursery in the future, but for today I'm sharing a fun little (and super quick) DIY nursery letter. This is pretty versatile. I first had it on a shelf with his green giraffe, but after moving into our new place it found its place prominently on the wall over his crib with my fabric hoops. 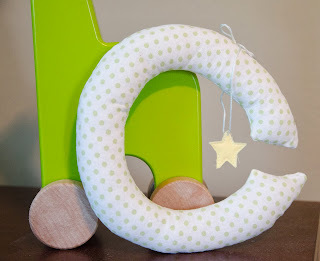 My favorite part of this letter...the little star hanging on a string. 1. Start by ironing your fabric. 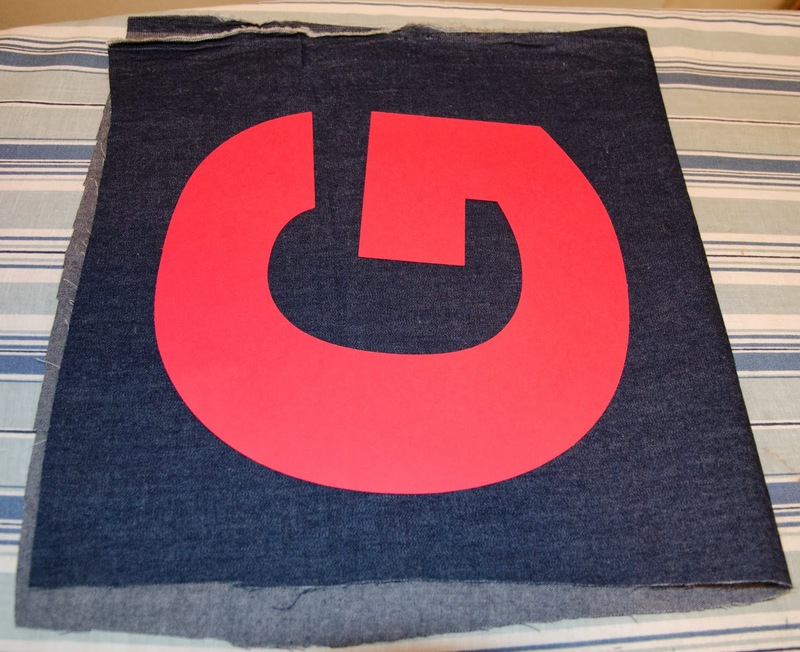 Then fold it with right sides together. Your letter should fit comfortably on the folded fabric. I'm not including dimensions because you can make this letter as big or small as you want. Just remember - the stuffed letter will be much smaller and thinner than the letter drawn on the fabric. Make your letter big and chunky to account for seam allowance on both sides and the thickness from stuffing. 2. 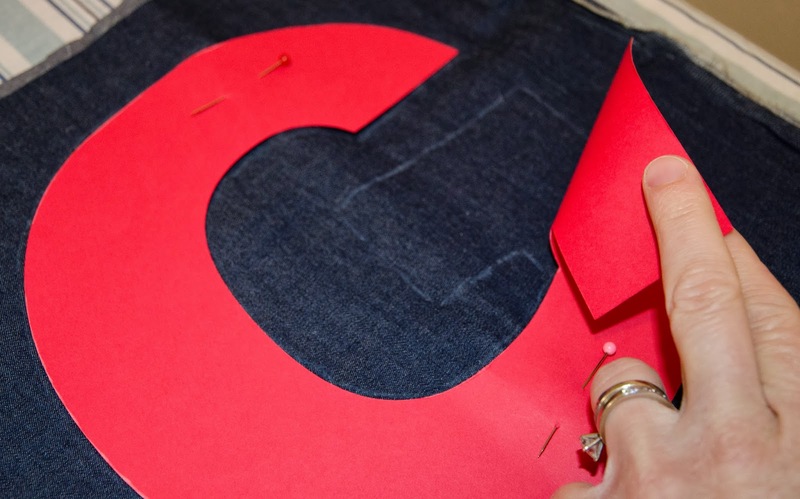 Pin the material to prevent shifting. Draw or trace your letter onto the wrong side of the fabric. 4. Sew around ALMOST the entire border of the letter (I used an 1/8" seam allowance) but leave enough open to allow turning the letter inside out. The amount needed will depend on the letter. Think through how you will turn out your letter - some may be more difficult than others (like an A). 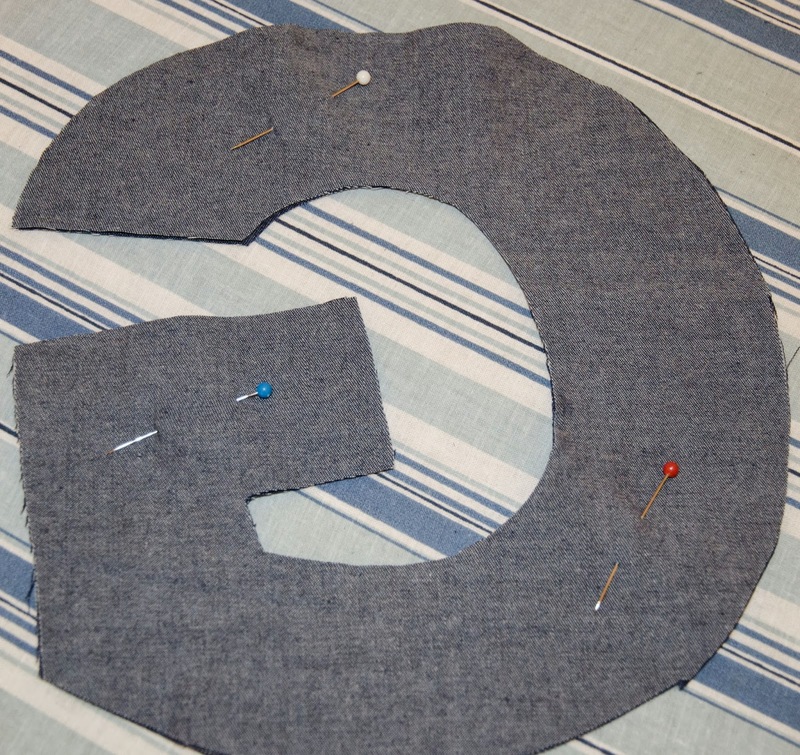 You may have to hand sew parts shut after turning the letter right side out. For the C I left the top of the horizontal bar open and it worked great. 5. At this point you can snip off the corners of the letters to make them lay better after turning them right side out. Just be sure to stay away from the seam. 6. Turn your letter right side out. I found two tools very helpful for this: a point turner and a bodkin. 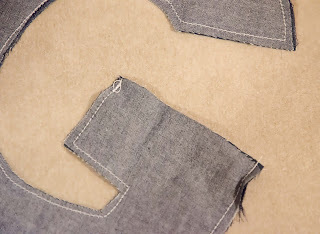 Bodkins are used for things like stringing elastic through a waistband. I pushed it through the letter, clipped it on to the far side and then pulled it back through to turn the letter right side out. Then I used the turner to push out the corners of the letter. 7. Now you stuff with Poly-Fil. 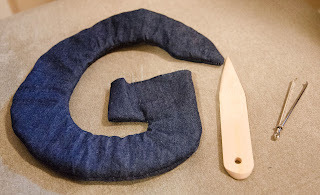 I ended up using a combination of a pencil and the point turner to get the stuffing all the way into the letter. It takes a little bit to work it all in there evenly. 8. 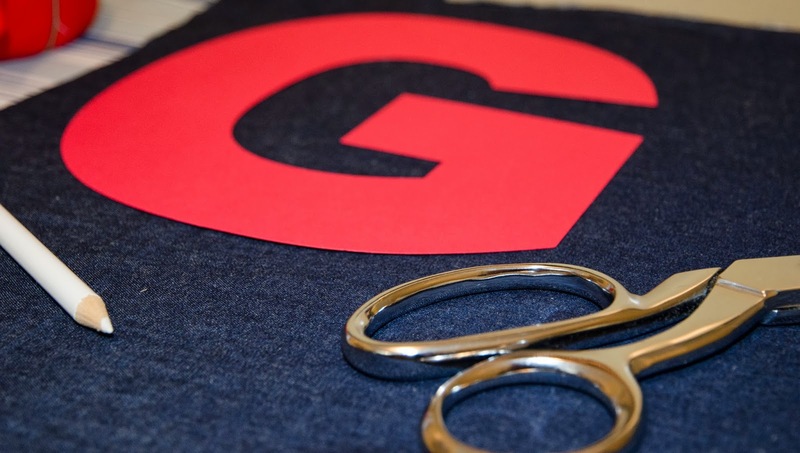 Lastly, you have to close up the letter by hand-sewing an invisible stitch. If you are unfamiliar, it is much easier than it sounds. Just look on Pinterest and there are lots of tutorials/pictures. 9. Now, you could stop there, but I wanted to add a little something extra with a hanging star. Take a small scrap of fabric and cut it in two. Place a scrap of cotton batting in between the two pieces and stitch a star shape. 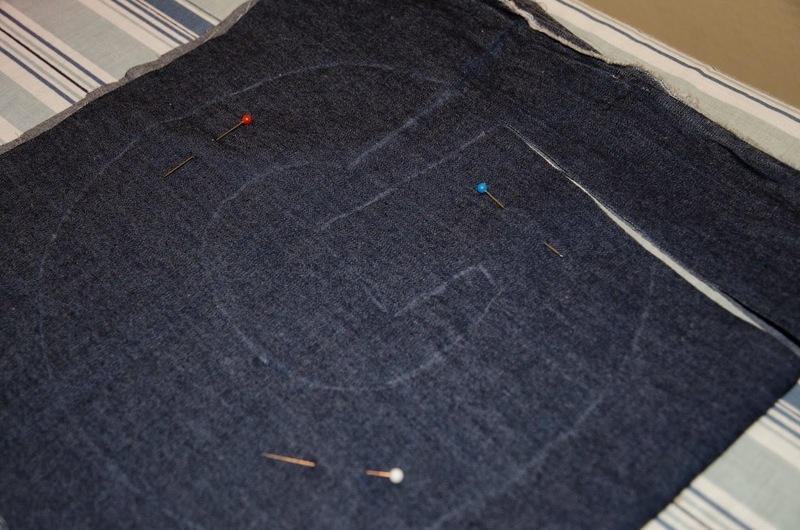 Then cut around the edge of the star leaving a buffer outside the seam. Thread a hand-sewing needle with the embroidery floss and string the star onto the floss. Put the star at the desired hanging length and tie a bow with the two ends of the floss. Cut the floss ends of the bow. Place the star loop over the letter and position as desired. Finally, use a bit more floss to hand stitch the hanging star loop to the back of the letter. 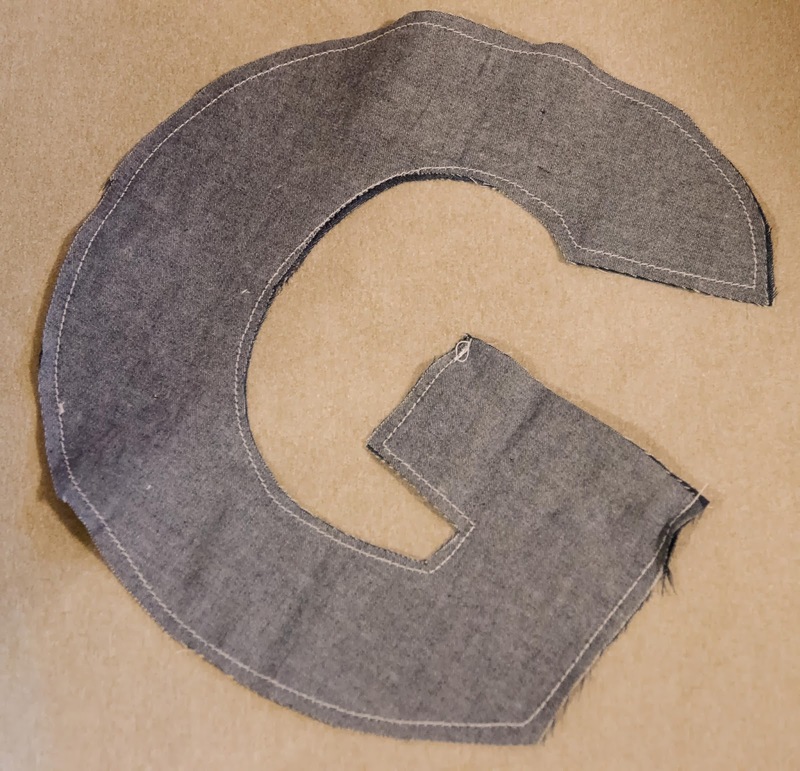 If you want to hang your letter from the wall, you can again use the embroidery floss to add a little hanging loop on the back of the letter. The letters are very light so you don't need anything too strong. I smile every time I see this little letter :).